Sen. John McCain, R-Arizona, lashed out against the Trump administration's "zero tolerance" policy which has sparked widespread outcry over the treatment of children of immigrants at the U.S.-Mexico border. McCain, who is at his home in Arizona where he is receiving treatment related to his brain cancer diagnosis, tweeted that the administration's policy should be rescinded immediately. "The administration's current family separation policy is an affront to the decency of the American people, and contrary to principles and values upon which our nation was founded," McCain, a frequent Trump critic, wrote. He added, "The administration has the power to rescind this policy. It should do so now." 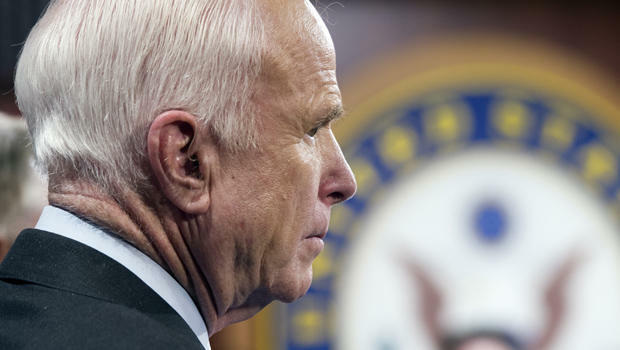 McCain is the latest Republican to part with the president and the party on the policy that is at the root of a nationwide debate over immigration and the country's handling of children in federal custody. Sen. John Kennedy, R-Louisiana, told reporters on Capitol Hill on Monday that the policy was a "hot mess" and blamed "prior administrations and prior congresses." Sen. Lisa Murkowski, R-Alaska, said in a statement that the "time is now for the White House to end the cruel, tragic separations of families" saying it's "not consistent with our values." Meanwhile, fellow Arizona Republican Sen. Jeff Flake did not outright condemn the practice of family separation, but he wrote a letter with Sen. Susan Collins, R-Maine, demanding answers from Homeland Security and Health and Human Services as to how they are ensuring the "safety and security of young children" at the border. On Monday, senior administration officials, including Mr. Trump himself, defended the controversial policy. Both Attorney General Jeff Sessions and Homeland Security Secretary Kirstjen Nielsen put the responsibility on Congress to find a fix to the nation's immigration issues. The two Cabinet members also claimed that children in government detention centers are being well taken care of, despite troubling images of kids in caged enclosures circulating online. Mr. Trump meanwhile once again blamed Democrats for the policy and defended the practice by saying the "U.S. will not be a migrant camp and it will not be a refugee holding facility." The president said that if Democrats would "sit down instead of obstructing, we could have something done very quickly" with regards to immigration legislation.